35,000 protesters who began a march in Nashik, Maharashtra on March 6 reached Mumbai on Sunday (March 11) evening. 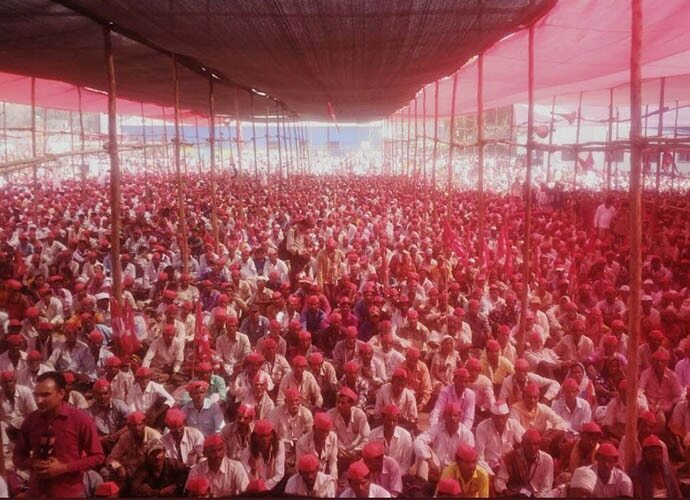 More than 30,000 farmers from across Maharashtra have congregated at Azad Maidan in south Mumbai, turning it into a “sea of red”, with a range of demands, including farm loan waiver. The protest rally, termed Kisan Long March, is one-of-its-kind as no protest in the recent past involving so many people has been carried out so peacefully garnering support from all corners, including citizens and a number of political parties. In 2017, the Maharashtra government announced a conditional Rs 34,000 crore loan waiver loan waiver but it was not implemented properly. According to reports, 2,414 farmers killed themselves in the state between January 1 and October 31, 2017. This time, the farmers are demanding complete and unconditional farm loan waiver, including electricity bills. Implementation of the Swaminathan Commission Report (2006), announcement of minimum support price for agriculture produce, and pension scheme for farmers also feature among the demands. Though the government made promises to the people in the past, it failed to honour its word. But the thousands of people walking to the capital do not only comprise farmers. There are tribal cultivators too demanding implementation of the Forest Rights Act, which accords the rights of the forest to the forest-dwelling communities. The state government has set up a six-member committee to look into the demands. 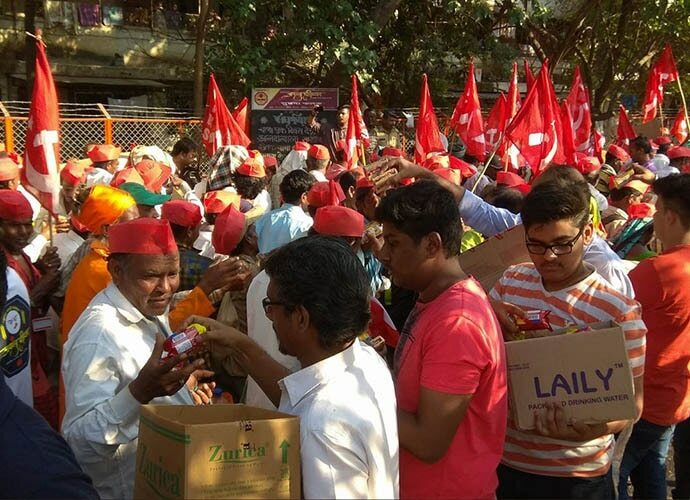 While the agrarian crisis of Maharashtra has been a much discussed issue, this is the first time that the All India Kisan Sabha (AIKS), the agriculture wing of the CPM, has taken the protest to the heart of the capital. In 2017, the AIKS observed a 11-day farmers’ strike and a road blockade across the state, but most of their protests, being confined within districts, never succeeded in attracting the attention of city residents. Preparations for the six-day march began soon after it was announced on February 21. Several village-level meetings took place to mobilise the farmers along with the tribals. The rally began on March 6 from CBS Chowk in Nashik. Braving the heat, the protesters, including women and senior citizens, crossed 35km a day on an average. They halted at several places, cooked food and restarted their jouney. The rally entered Mumbai on Sunday and reached Azad Maidan on Monday morning. 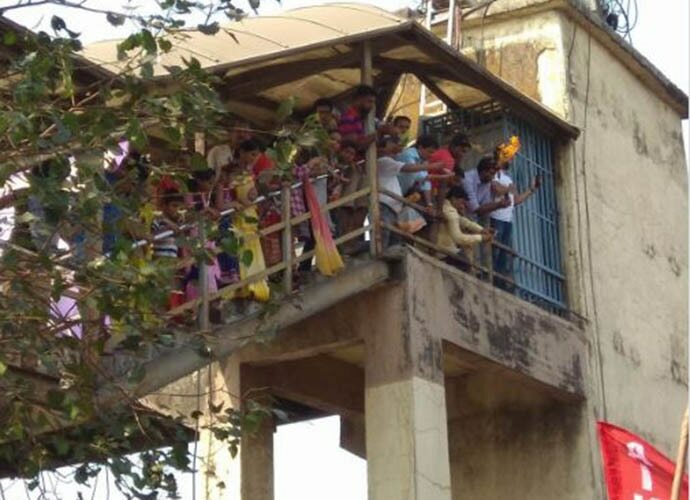 Apprehensions that the traffic of the city will be thrown out of gear creating much inconvenience to commuters, including examinees, were put to rest as the protesters walked on Sunday night to reach Azad Maidan early in the morning, before the rush starts. No traffic diversions were reported. For the residents of Mumbai, the multitudes of people walking barefoot, carrying red flags in a peaceful march for their demands is a unique experience. On Saturday, when the march reached Thane, residents came out and interacted with the farmers. "There has been so much help that an entire truck the protesters brought with them was still full of food," Kisan Gujar, state president of the All India Kisan Sabha, said. Many NGOs, local organisations, resident welfare groups started providing them with water and food. The farmers, however, refused to accept donations. The political support the march has received has been reassuring for the CPM, following its recent rout in the Tripura elections. NCP president Sharad Pawar, state Congress president Ashok Chavan, Shiv Sena leader Aditya Thackeray, Maharashtra AAP and MNS chief Raj Thackeray have supported the cause of the farmers.